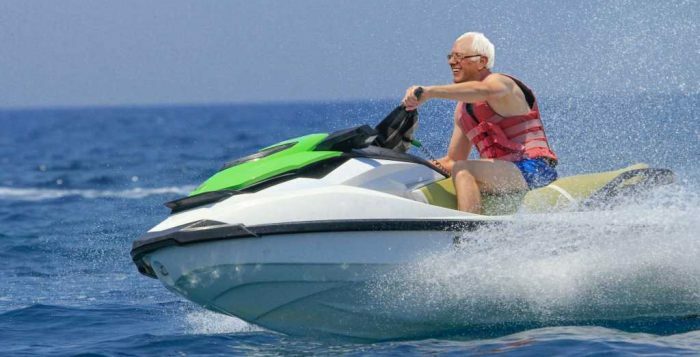 What is Bernie Sanders up to these days? After the general election, U.S. Sen. Bernie Sanders was asked to reach out to America. So he undertook a national tour — on jet skis. I was surprised but not shocked that Trump won. The Democratic Party has moved away from its roots in the working people of this nation and a real economic plan. We need a 50 state solution and Chuck Schumer has entrusted me with the chair of the outreach effort — it’s a padded waterproof chair straddling a supercharged four cylinders that gets to 65mph in five seconds. A Wall Street Journal reporter yelled after him that the red states were all landlocked, but he’d gone, spraying down the Monongahela River with the wind in his thin grey hair and Amy Goodman strapped to his back.